When we have opened the case of the ASIC miner we’ve discovered that the cooling fan used inside is a 92mm Evercool EC9225M12CA, a mid range fan that does 2200 rpm with about 1.8W of power usage. Apparently the fan itself was sufficient to cool the miner with its 39.35 CFM of air flow and interestingly enough the specifications of the fan do say less than 25 dBA in terms of noise generated. The fan itself was directly soldered to the pins of the 6-pin PCI-E power connector on the unit, there is no thermal control or variable rpm, it is working at maximum all of the time. Running the miner without its metal casing has show us that it can be quite silent indeed, so the cause of the noise apparently was the metal case of the miner. More specifically the holes at the fan air intake that apparently are responsible for the significant increase of the noise level, so when TechnoBit has promised us a silent Bitcoin ASIC miner they should have modified the case of the device, so that it can really be silent and not the opposite – make a case that will increase the noise level way over what was promised in terms of specifications. The cooling of the single RockerBox ASIC chip that is at the heart of the DICE miner is sufficiently provided by two large aluminum heatsinks, one on top interfacing with a solid copper block to the ASIC chip and one at the bottom with direct contact to the whole surface of the PCB. There is enough thermal paste in between the heatsinks to provide good heat transfer and the not so powerful cooling fan has no trouble keeping the temperatures low, so that the about 100W of power used at the stock settings are not a problem. The device can also handle a nice boost in performance with some overclocking that is possible via parameters for the ASIC chip voltage and operating frequency, though you should be careful should you decide to clock the unit higher. In the end we take a look at the operating temperatures of the DICE with the help of a thermal imaging camera, the thermal image you see above shows how hot the top and bottom heatsinks get while the device is working normally. 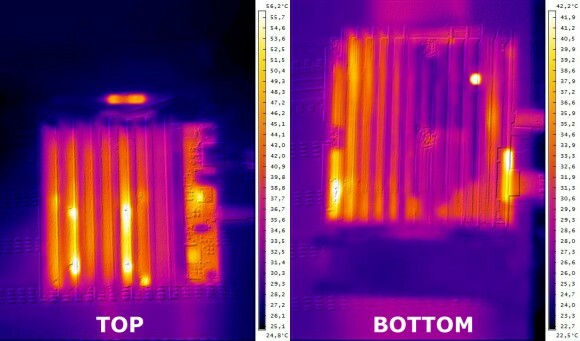 We are getting close to 60 degrees at the top heatsink and a bit over 40 at the bottom at the hottest sports, do note however that the operating temperature of the Bitcoin ASIC chip under the heatsink should be higher with something like 10-20 degrees Celsius over the temperature we have measured on the heatsink. So if you decide to overclock the miner you should proceed with caution and monitor the operating temperatures as the power usage increases along with the hashrate when you increase the operating voltage and frequency of the Bitcoin ASIC chip. Today we’ve been playing with the TechnoBit DICE Bitcoin ASIC miner to see what is the actual performance we are getting with the default settings as well as to see what is the overclock limit of the device. We were again on a quest to find out how exactly we should overclock the DICE from the options available in the cgminer config file as apparently the version provided for the DICE also contains settings for other ASIC miners, but the ones we need to tweak are the “hexminerr” settings as they are the ones for the 1-chip DICE as well as the other 4-chip RockerBox ASIC miner that TechnoBit has. Below you can find the description about the available options that are available as description. 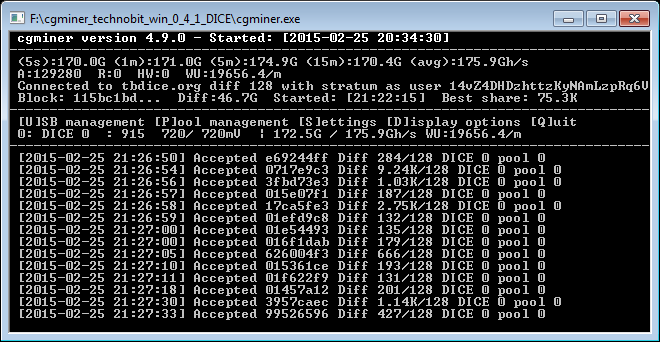 Apparently the description is referring to recommended values for the 4-chip miner as does the default settings in the config file set for the DICE version of cgminer provided by TechnoBit, though they will work with the single chip DICE as well. By default the values set in the config file are 720 mV (0.72V) for as voltage instead of the “default” 0.69V value and the operating frequency is 915 MHz. With these settings we’ve managed to see a hashrate of about 170-175 GHS as reported by cgminer and the mining pool averaged for a long period of time. 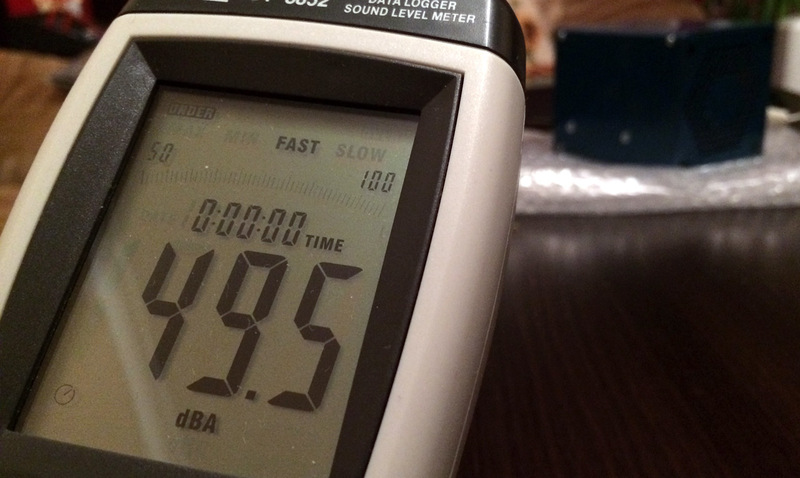 With the standard settings for operating frequency and voltage the DICE miner does manage to consume about 98.4W of power, though with some additional overclock the power usage does rise. Overclocking the device does take some time and effort as it seems that even though it may start running at a higher voltage and frequency that you set in a few minutes it may stop responding and you need to unplug and then plug the USB connector and restart the miner. IF you experience such a problem you might want to try increasing the pic-roll value a bit and see if that will help with the USB issue when working at a higher operating frequency. Do not that rising the pic-roll value may be just a temporary solution that will extend the time before the miner stops responding again. Some guidelines for overclocking, 1000 MHz should be possible with a voltage of about 0.74V with a power usage of about 115W and expected average hashrate of about 190 GHS. You may also try going for a maximum of up to about 1150 MHz with up to 0.8V that should get you at around 135W of power usage and expected hashrate in the range of 200-205 GHS, but be careful and try not to go for higher as it may be dangerous to try and push the miner more. Do note that your results may vary from unit to unit, also do note that the power usage values we cite here are for the actual power consumed by the miner on the 12V line and not the power usage at the wall. The total power usage measured at the wall may depend based on the power supply you are using and what efficiency it will have, but you need to add additional 10-20% to the cited figures to get the expected power usage at the wall.